Storey Publishing, LLC, 9781635860023, 200pp. Rainfall levels are rarely optimal, but there are hundreds of things you can do to efficiently conserve and use the water you do have and to reduce the impact of drought on your soil, crops, livestock, and farm or ranch ecosystem. 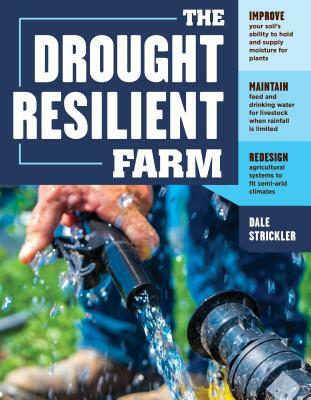 Author Dale Strickler introduces you to the same innovative systems he used to transform his own drought-stricken family farm in Kansas into a thriving, water-wise, and profitable enterprise, maximizing healthy cropland, pasture, and water supply. Ranging from simple, short-term projects such as installing rain-collection ollas to long-term land-management planning strategies, Strickler’s methods show how to get more water into the soil, keep it in the soil, and help plants and livestock access it. Dale Strickler is the author of Managing Pasture and The Drought-Resilient Farm. He is a leader in the soil health movement and an agronomist for Green Cover Seed, the nation’s leading cover crop-specific seed company. Strickler holds degrees in agronomy from Kansas State University and taught college for 15 years. He worked as an agronomist for Land O’Lakes, Star Seed, and Valent USA prior to working with Green Cover Seed. He successfully farms and ranches cattle in Kansas.